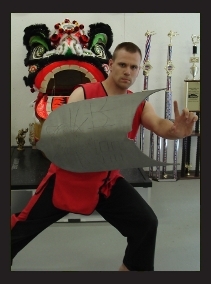 Sifu John Fillipon is the master instructor of Twin Dragon Martial Arts. He became interested in the martial arts at a very young age, and began his training at six years old. Sifu John's first experience in the Martial Arts was with Tae Kwon Do. Sifu then trained in Kempo Karate, and achieved a 5th degree Black Belt, masters rank, in that style which has roots in Japan, and eventually back to the Shaolin Temple in China. It was during this time that Sifu became interested in Traditional Chinese Kung Fu. Unfortunately at the time there were no qualified instructors for him to explore this with. Sifu also trained in Kickboxing and Ju Jitsu during this period. In January 1998 Sifu was invited by an aquaintance to travel to California to meet his master and participate in some training. Sifu accepted and later that month met Grandmaster Lam. With Grandmaster Lam, Sifu John found just what he had been looking for, and for the last 17 years has been training in Traditional Hung Gar and Shaolin Kung Fu. Sifu John trained at Shaolin Temple during the summers of 2002 and 2005 which was arranged by Grandmaster Lam. This provided him the opportunity to train with other highly skilled masters and improve his own skills in Chin Na as well as several other shaolin skills. It was with the greatest Honor and Respect that Sifu John, in 2008, along with his Brothers ( including that aquaintance from long ago ) participated in the Bai See cerimony and became an official Disciple of Grandmaster Lam. Sifu John continues to develop his martial skills and works to Honor his master and family by spreading Traditional Kung Fu to the communities of New Hampshire. Sifu John has a Bachelors of Science Degree in Childhood Studies, and is a licensed teacher certified by the state of New Hampshire. He has Ten Years experience teaching in public school, and specializes in teaching students of all ages and abilities. That combined with his 33+ years experience in the Martial Arts allows him to offer training that is second to None. Sifu offers classes for children, adults, and a unique family style class. Although Sifu has expertise in several areas, training at Twin Dragon primarily focuses on Hung Gar & Shaolin Kung Fu Styles. Both Styles originated at the Shaolin Temple and have many similar aspects. As such both styles require students to be straight-forward, honest and hard working. Self-control is stressed, and all students are expected to use their kung fu knowledge properly. Our students are taught to be firm believers in doing what is morally correct and helping those in need. for the last 22 years and will continue to do so for many years to come.